June 2, 2014 – The Public Theater (Artistic Director, Oskar Eustis; Executive Director, Patrick Willingham) announced today that John Lithgow, Jesse Tyler Ferguson, Zachary Quinto, Martha Plimpton, Billy Porter, Jonathan Groff, Sutton Foster, Joshua Bell, Lindsay Mendez, Claybourne Elder, Krysta Rodriguez, Marissa McGowan, Laura Shoop, Peter Dugan, Nikka Graff Lanzarone, Jessica Wu, Mylinda Hull, Brooke Sunny Moriber, Nicole Lewis and other special guests and alumni will perform in the one-night-only Public Theater annual gala ONE THRILLING COMBINATION on Monday, June 23 at the Delacorte Theater. Directed by Ted Sperling, the gala event will celebrate Marvin Hamlisch, The Public Theater and the 40th anniversary of the creation of A Chorus Line. For nearly 60 years, The Public has developed and produced groundbreaking new works while nurturing the careers of artists and providing access for audiences with thousands of free and low-cost tickets. Though Marvin Hamlisch passed away in 2012, the spirit of his original collaboration with The Public lives on. His contributions to A Chorus Line changed musical theater history and changed the trajectory of The Public Theater. The Public is thrilled to be honoring Hamlisch as this year’s 2014 Artistic Honoree, in an evening that will also include songs from throughout his theatrical career. Renée Beaumont and Lizanne Rosenstein will serve as Gala Co-Chairs for this memorable evening in Central Park to support The Public Theater. The evening at the Delacorte will begin with cocktails at 5:00 p.m. followed by dinner alfresco in Central Park. The performance of ONE THRILLING COMBINATION at 8:00 p.m. will be followed by a dessert reception under the stars. The gala performance rain date is Tuesday, June 24. 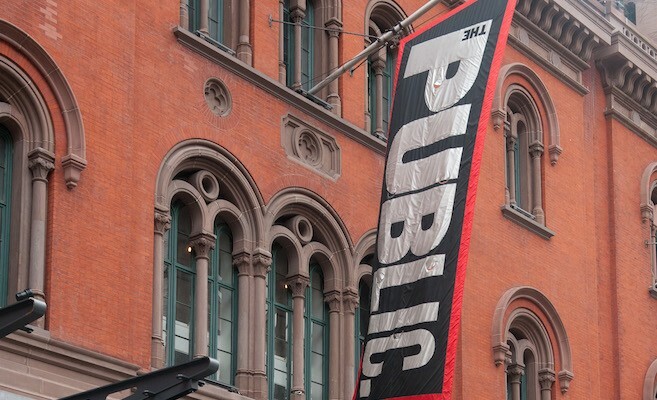 Tickets to The Public Theater’s Annual Gala ONE THRILLING COMBINATION start at $650 and are available for purchase by calling (212) 539-8634, online at www.publictheater.org, or via email at gala@publictheater.org. Proceeds from the gala will help support The Public’s mission of providing a home for artists who give voice to the pressing issues of our time, provide affordable access to thousands of New Yorkers with free Shakespeare in the Park and other groundbreaking works, and strengthen the vital relationship between our artists and audiences. A CHORUS LINE, first staged in The Public’s Newman Theater in 1975, features a book by Nicholas Dante and James Kirkwood, lyrics by Edward Kleban, and music by Marvin Hamlisch. The show was conceived and originally directed and choreographed by Michael Bennett and later transferred to Broadway to win the 1976 Tony Award for Best Musical, as well as eight other Tony Awards. The original Public Theater cast featured Kelly Bishop as Sheila, Robert LuPone as Zach, and Donna McKechnie as Cassie Ferguson. The gala evening features scenic design by Mary Hamrick, lighting design by Jeff Croiter, and sound design by ACME Sound Partners. TED SPERLING (Director) is The Public’s Musical Theater Initiative consultant, and is a director, music director, arranger, orchestrator, conductor, singer, pianist, and violinist. For The Public he directed the 2013 Gala Concert of The Pirates of Penzance, as well as See What I Wanna See and did the musical direction for Saturn Returns. In 2005, he won Tony and Drama Desk Awards for his orchestrations of The Light In The Piazza (also music director). His other Broadway credits as music director/conductor/pianist include Dirty Rotten Scoundrels, The Full Monty, How To Succeed In Business Without Really Trying, Kiss Of The Spider Woman, Angels In America, My Favorite Year, Falsettos, Drood, Les Misérables, Roza, and Sunday In The Park With George. Next Story → The 2014 New York Musical Theatre Festival (NYMF) announces lineup of productions, concerts, special events, and readings!